How do I become a member of the Branson Tourism Center Registered Travel Agent Program? It’s very easy. Simply fill out the Travel Agent Application here to get started. Once your application has been processed, you will receive an e-mail with instructions on how to log into your Travel Agent Account on Book.Branson.com and begin earning commissions. What is required to be eligible to participate in the Branson Tourism Center Registered Travel Agent Program? You must have an ARC/IATA or CLIA number to be eligible to participate in the Program. We will notify you by e-mail. If we reject your Application, we welcome you to reapply for participation in the Program at any time. Is it free to be a member of the Branson Tourism Center Registered Travel Agent Program? Yes. There is no cost to you to become a Registered Travel Agent with Book.Branson.com. In fact, as a Registered Travel Agent, we will pay you commissions on purchases that you make on Book.Branson.com. Can I participate in the Registered Travel Agent Program if my company is based outside of the United States? Yes. However, purchases made on Book.Branson.com require payment in U.S. dollars, and all commission checks that you receive will be in U.S. dollars. Do I need to give you a W-9 as part of the application process? Yes. We require a W-9 from all Registered Travel Agents because we are required to report the commissions you earn. Note: The information entered on your W-9 Form must match what you've entered in the Agency Information block on the online application. Why haven't I received my e-mail notification after registering for the program? Make sure that emails from Book.Branson.com aren't going into your junk or spam e-mail folders. If you need additional assistance, contact us by clicking here. How do I earn commissions on my purchases from Book.Branson.com? Once your Application has been accepted, you will be given access to log into the Travel Agent Control Panel on Book.Branson.com. While logged in to your account, any eligible purchases you make will earn commissions. You will not earn commissions on any purchases made on Book.Branson.com while not logged into your Registered Travel Agent account, and you will not earn commissions on any purchases made over the phone with a Branson Tourism Center agent. How can earn a commission for my purchase and get assistance with my purchase? If you want to earn a commission for your Book.Branson.com or Branson Tourism Center order but you need assistance from a reservation agent, you can place your order over the phone with a Branson Tourism Center agent and add your commission separately. You will not earn a commission from Book.Branson.com or Branson Tourism Center for placing an order on the phone with an agent. However, you can request that the pricing information on your order confirmation be concealed, and you can add your own commission on top of the price charged by Branson Tourism Center. We will pay the commission to you after the items purchased on Book.Branson.com are consumed, and not when they are purchased. For example, if a customer places an order on January 1 for tickets to a show that will take place on June 1, commissions will be calculated and paid after the show takes place on June 1, and not prior to that date. Commissions will be paid twice per month, regardless of how much has been earned at that point. The total commissions due to you will be calculated as of the 1st & 15th calendar day of each month, and a check for that amount (less any taxes required to be withheld under applicable law) will be sent to you within the following week. To who/where will my commission checks be sent? Commission checks will be made payable to the Travel Agency name that you use when you register and sent to the Travel Agency address that you use to register. If your address ever changes, you can update your contact information online through your Travel Agent Control Panel. Can I see my sales/purchase activity and commissions? Yes. 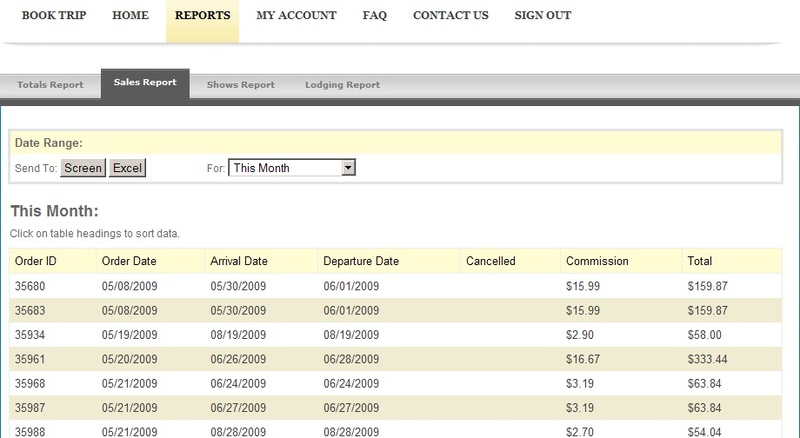 You can review your sales reports, statistics and other information by accessing the Travel Agent Control Pane at Book.Branson.com. After you are accepted into the Program, we will give you the necessary password to access the Travel Agent Control Panel, where you will be able to receive sales statistics, reports, and other information. This online service is provided to all members free of charge and is available 24 hours a day, 7 days a week. Simply go to Book.Branson.com/travelagents and click “Sign In.” Once logged in, navigate to the “Reports” tab to view and export detailed sales and commissions reports. Can I update my account and contact information online? Yes, by logging into the Affiliate Control Panel, you can make sure to keep your account and contact information up to date. Why do the reports label my commissions as "Projected" Commissions? Commissions are paid only after the customer has completed their vacation. Because the customer can modify or cancel any part of their purchase prior to their arrival, commissions cannot be finalized until the vacation has been completed. Do I have to be able to process transactions? No. All transactions will be processed through Book.Branson.com and Branson Tourism Center. How do customers receive their tickets and lodging confirmations? Customers will need to physically check in at Branson Tourism Center at the address below upon arrival into Branson to pick up their show, attraction, and lodging vouchers. Why do customers have to physically check in at Branson Tourism? The voucher system for show and attraction tickets and lodging that is used by Book.Branson.com and Branson Tourism Center allows us to sell tickets to virtually every show and attraction in Branson, as well as rooms at virtually every hotel in Branson. Customers will need to physically check in at the Branson Tourism Center building in order to pick up their welcome packet, which will include their itinerary, confirmation letter, and vouchers for lodging and show or attraction reservations. While picking up their welcome packet, a reservation agent will go through the itinerary with the customer, help them locate all of their events and lodging on a local map, and help better orient them to the Branson area while answering any questions that they may have.